Designed for compact communications systems. VISHAY Intertechnology, represented in Australia by Braemac , has released two wirewound, surface-mount inductors in compact 0402 and 0603 case sizes. They provide space savings in communications applications with limited board space. Applications include mobile phones, cable modems, ADSL, repeaters, Bluetooth devices, and other electronic devices. The new IMC-0402-01 and IMC-0603-01 measure 1mm x 0.55mm x 0.5mm and 1.6mm x 1.05mm x 1.05mm. The new wirewound inductors feature advances such as higher self-resonant frequencies (SRF), better Q factors, and more stable performance. The IMC-0402-01 offers SRF values ranging from 2100MHz to 6000MHz over an inductance range of 1nH to 47nH and minimum Q factor values from 26 to 13. 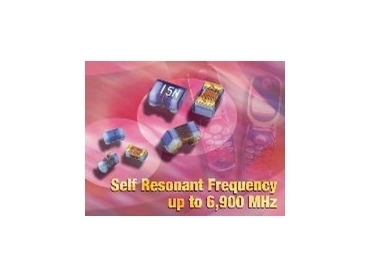 The IMC-0603-01 has SRF values range from 1000MHz to 6900MHz over an inductance range of 2nH to 270nH and minimum Q factor values range from 43 to 16. Rated DC current ranges from 150 mA to 1360 mA for the IMC-0402-01 and 170 mA to 700 mA for the IMC-0603-01. Tolerances as low as ±2% are available for devices with inductance ratings of 10nH and above. The IMC inductors are rated for an operating temperature range of -40°C to 125°C and a storage temperature of -40°C to 125 °C. Their lead-free, surface-mount construction enables easy assembly with excellent resistance to soldering heat. Both devices are suitable for reflow soldering and are available in tape-and-reel packaging for automatic handling.